Mr. and Mrs. Green enjoy a sweet, trusting relationship. They love to try invent new things from magic tricks which sometimes go awry to a solar-powered scooter. Always kind in word and deed, the two alligators practice the art of friendship to make their marriage fun. This hysterical little chapter book will stretch a youngster's intellect as it encourages vocabulary building, exploration into inventions and inventors, and the value of developing respectful relationships that last. It should find a home in every library and on every child's night stand where it will be shared again and again. Kids Wings offers fun activities and extensions for On the Go With Mr. and Mrs. Green Your students will enjoy the easy chapter book with clever plots that lead to mastery learning in your classroom. On the Go With Mr. and Mrs. Green is included in the Kids Wings collection, Reading Seeds in a spiral-bound book with CD. 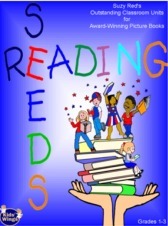 If you would pay $12.95 for On the Go With Mr. and Mrs. Green that is just ONE of the literature guides in Reading Seeds, just think how you'll love all 43 guides for just $25! That's about $.58 each! Click through the titles and you'll agree that $25 is a great bargain for these amazing lesson plans and activities! Order soon because this offer only lasts as long as our supply. The Unit for On the Go With Mr. and Mrs. Green is a part of a collection of 42 units in Reading Seeds.